This pan-fried falafel is delicious and better for you than the deep-fried falafel you can get at food trucks and Mediterranean restaurants. 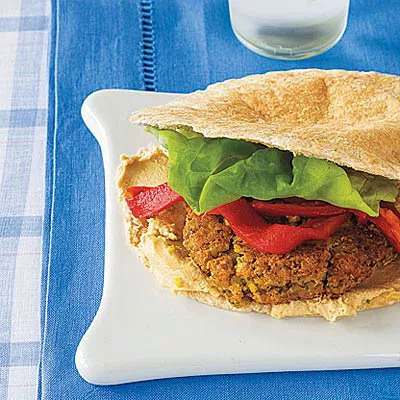 In our recipe, the two main ingredients, bulgur and garbanzo beans, are combined with spices, herbs, and garlic to make tasty patties that are great substitutes for burgers. It's also topped with tahini sauce, a paste made from sesame seeds and olive oil, which is also healthier than the ketchup or barbecue sauce that you'd typically put on a burger. With less than 400 calories and 10 grams of fiber (that's more than one-third the daily-recommended intake of fiber for most of us) this is the perfect recipe for dinner tonight. Ingredients: bulgur, garbanzo beans, egg white, parsley, mint, garlic, cayenne pepper, ground cumin, salt, pepper, olive oil, tahini, lemon juice, water, lettuce, roasted red peppers, pitas.